I’ve already reviewed the first 11 issues but this one got lost in my collection. It’s time to complete this series. The Quest Team heads to Easter Island (Rapa Nui is one of the historic names for the island) so Dr. Quest can test a new underground imaging device for areas where digging isn’t allowed, like Easter Island. Not really up for lectures Jonny goes exploring alone, meeting a boy who knows where an ancient treasure is hidden. It might be the same treasure the man who replaced Dr. Quest’s contact and his partner are searching for. While the team is able to take the bad guys down (or rather they take each other out of the picture), they find that the treasure is actually the eyes from the Easter Island heads, removed until the time men stop being evil to each other out of greed. What they got right: It is a short but interesting adventure. I don’t know how truthful the story of Easter Island as told in this comic is, but it’s a good story anyway. The art looks pretty close to the character models and styles of the show. What they got wrong: The Easter Island history falls short of being a lecture on the evils of men, but only barely. There are a couple of size issues, and Jonny feels slightly off until he meets the other boy. I guess he’s in a bad mood because of the lecturing when he’s a “man of action” and the boy is admittedly better at telling the exposition than some slide show but it’s still odd to see Jonny being anti-lecture for this story. Recommendation: This series has some highs and lows but overall if you liked the 90s remake of the show you’ll like the comics. They’re worth looking into. 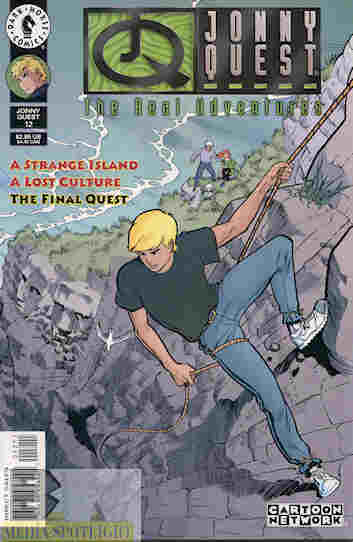 Posted by ShadowWing Tronix on January 10, 2018 in Animation Spotlight, Television Spotlight, Yesterday's Comics and tagged Dark Horse, Jonny Quest, Real Adventures of Jonny Quest. The comic book’s setting of Easter Island makes for a good story. Easter Island is one of those mysterious places such as Stonehenge. Mysterious locales are always perfect for a Johnny Quest tale. Personally, I prefer the Comico version of Johnny Quest because those comics stayed fairly close to the feel of the classic Johnny Quest cartoon. My favorite Comico Johnny Quest issue is the one where the Quest team goes to coastal Maine and encounters a haunted house. What a spectacular, spooky story it was!